For 33 years or so, ricotta cheese eluded me. I don't think I was actively avoiding it, and I may have actually eaten it in some lasagna or random cheesecake somewhere, but I just didn't know much about it or foods containing it. Then, I had some incredible ricotta gnocchi at a pretty excellent restaurant in Charleston that made me OH-so-happy. SO light and fluffy and SO, so tasty. All my life, I had thought of gnocchi as dense and bland, and this was the absolute opposite. It literally melted in my mouth and was as pillow-esque as could be. I daresay I'll never forget it, and hope to try to recreate it myself sometime soon...or at least go back to Charleston and order it again! "Ricotta" literally means recooked, but we don't have to focus on that. As I understand it, it's essentially composed of curds that are made from the whey left over from the production of other cheeses. It adds a moistness and richness to pound cake that goes above and beyond what you'd usually expect, which is saying a lot since pound cake is, by definition, moist and rich. Try this cake! Even if you think cheese in cake batter is weird, you never know for sure until you try. I learned that the hard way and wasted 33 years of prime ricotta gnocchi eating time. The simple maple glaze is nice, but definitely not required (and I got mine a little too thick!)! Preheat your oven to 350 degrees F. Grease and flour a bundt pan that holds at least 9 cups of batter or a 9x5-inch loaf pan. In a medium bowl, sift together cake flour, baking powder, and salt. You won't regret doing this, even though it takes a little extra time and effort. In a large bowl, with an electric mixer, cream butter, ricotta, and sugar on medium speed until smooth, about 2 minutes. Beat eggs in one at a time, scraping down the sides of the bowl after each addition. Add vanilla extract. On low speed, beat in dry ingredients until well combined. Do not over-mix. Pour batter into prepared pan and smooth down with a spatula. Bake for 15 minutes then turn pan 180 degrees to ensure even browning. Lower temperature to 325 degrees F and bake about 40 minutes more, until cake springs back lightly and a toothpick inserted in the center comes out clean. Let the cake cool in the pan for 10 minutes or so, then turn it out onto a cooling rack to cool completely. This cake looks heavenly! Ricotta is such a great ingredient. Looks incredibly good. I think I may have to try this weekend. I have a tub of ricotta in my fridge, just bought yesterday and there will be leftover I know. I love ricotta, so I have to try it. I will definitely try this and I will use anthotiro cheese which is equivalent to ricotta! Looks delicious! Ricotta is the best! (And let me know if you want my recipe for a homemade version, which is SO easy and SO good!) Meantime, this looks like a delectable way to use it! I love to use ricotta in cakes! That smooth and even crumb is just perfect. You know I think I'm a little ricotta challenged myself. Still putting cottage cheese in my lasagna. Perhaps this will serve as inspiration! I always thought gnocchi was bland, and a whole lot of hype I didn't understand. I need to get to Charleston, I guess! I might have just enough ricotta in the fridge to bake this tomorrow. Fingers crossed. Your flowers are so beautiful! Your Ricotta Vanilla Pound Cake certainly looks moist and fluffy. I sure could use just one big bite right now! I bet the Maple Glaze added a whole new dimension. I love the sound of this, I bet the ricotta adds a great flavour and texture to the cake. Hi grace, the foodie bouquets are very pretty, who would have thought. This ricotta cake looks like a real keeper. Printed for later. I love ricotta in savory dishes but haven't tried it in my baking. Hmmmmm. 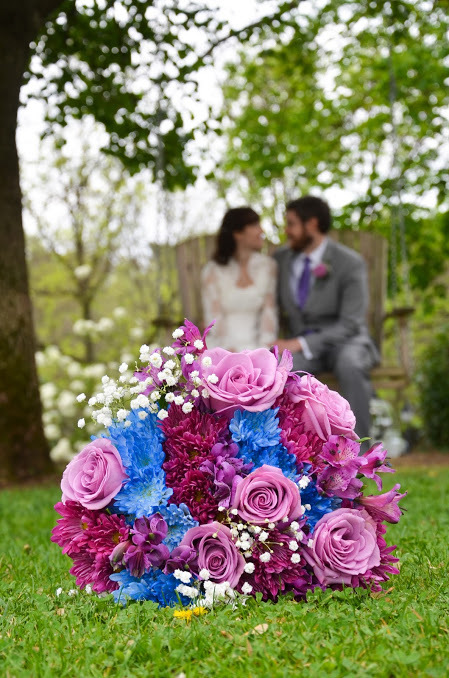 Love the bouquet photo. So pretty! Love the title, think it should be the title of my future biography. ;) Looks delicious too! Love ricotta cake...had it in Italy once. Must try this recipe. Also love your bouquet AND the photo! Nice story about you and the unforgettable ricotta :) It looks as good as you told. Wonderful fluffy feeling. Now I'd love to try ricotta. Was wondering if Ricotta would work for a Lemon Pound Cake? Could I use the same recipe and just substitute lemon juice for the vanilla and add some lemon jest?